Because it's tough to criticize a team after a 36-14 walloping of a conference opponent, this has turned into Point Out the Bad Decisions Our Quarterbacks Make Week. 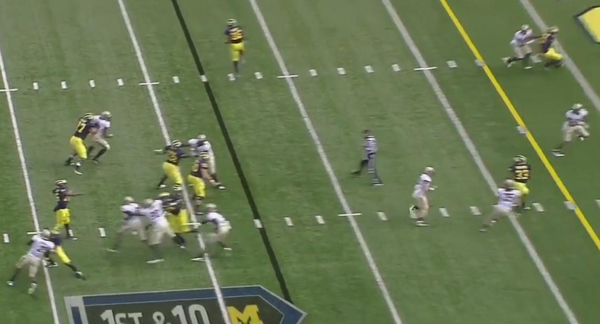 Yesterday, MGoBlog broke down Devin Gardner's horrible interception. Today, something from our starting quarterback: a missed touchdown pass to Kevin "Look How Open I Am" Koger. It's the end of the first half and Michigan has put together a long drive. It's first and 10 from the 13 yard line and Michigan is in a traditional I-formation with two wide receivers and Koger lined up as a tight end. As the ball is snapped, Hemingway and Roundtree both head downfield. 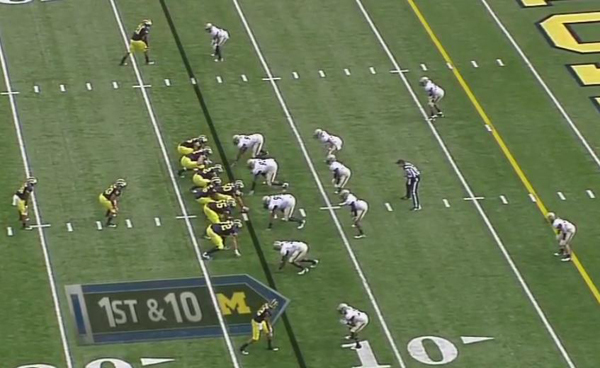 Michigan is going to run a RB iso play action. Koger holds at the line of scrimmage for a moment before releasing downfield in a passing route. A moment later, Denard is faking the handoff to Toussaint. Koger (mostly obscured by Lewan below) is releasing downfield. The safety at the top of the screen standing on the five yard line is assigned to Koger in man coverage. This is the ARGH screenshot. The safety that was supposed to cover Koger is reading Denard's eyes. This is a textbook example of "looking off a safety". The safety sees Denard looking at Roundtree running a corner route and starts cheating that way. Koger is already wide open in the flat. 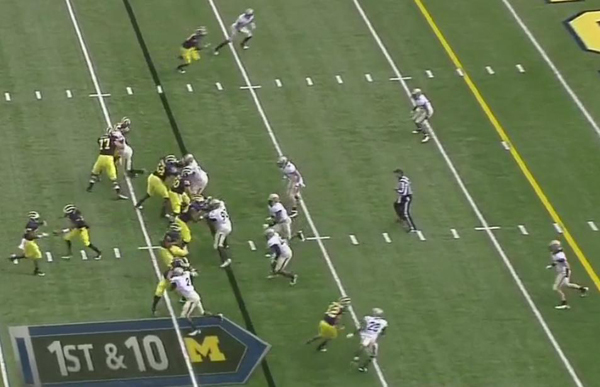 As Denard lets go of the ball, you can see how big of a mistake the pass is. Koger is wide open on the backside of the play without a defender between him and the endzone. 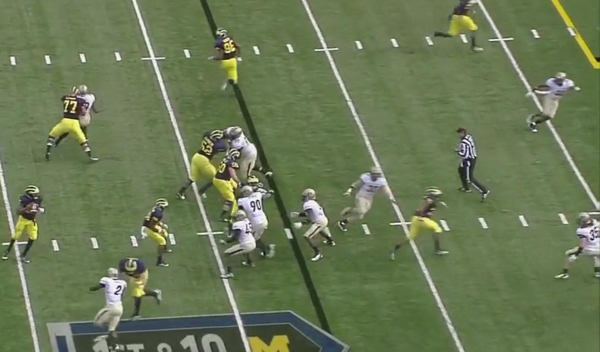 Instead of throwing to Koger, Denard had made up his mind pre-snap to throw the ball to Roundtree. But Roundtree is covered in the endzone. The Purdue cornerback breaks the pass up but probably should have intercepted it. Koger goes home and writes LiveJournal posts about being ignored. 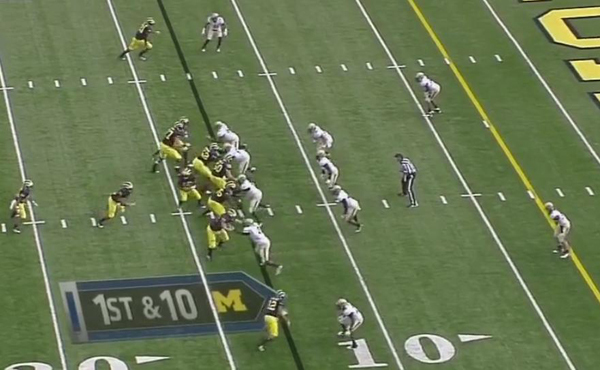 This is something that we've seen from Denard already this year: he seems to make up his mind pre-snap when Michigan has single coverage on the outside. Though Koger is likely he's final read, Denard needs to recognize what defenders are assigned to each potential receiver. When Denard turns around after the play action, he has to recognize the deep safety assigned to Koger is reading his eyes and cheating toward Roundtree in the corner. As was the case with Denard's interception early in the game, Purdue's defenders were reading his eyes, which always led them to the ball. Denard never goes through his reads and defenders are starting to key on that. This will be an issue as the season goes on. Unless he's able to progress through his reads and identify coverages, defenses will sell out on Denard's first read. This is why he throws into double coverage so frequently. Love your analysis. I totally missed this when I was watching the game. I hope this improves as the season goes on. And if it doesn't, I hope this is something that gets corrected during the offseason and is one of those improvements that Al Borges keeps hanging his hat on that he made with McNown. It is encouraging to know that we had another play call for an easy TD. This can be paired with the Hopkins miss in the MSU game. I've noticed this before, too, including all last year. Worse, it looks like the only way his aim is tolerable is when he's 100% locked in. It's either lock-in or mis-fire. He got away with it early last year b/c people hadn't noticed, the early-season defenses weren't great, and everyone was wildly open (their fear of him running was well-earned).